Imagine not being able to read text messages on your mobile phone. Your children come home from school and at the end of the day you cannot supervise or correct their homework, or read their progress reports at the end of the term. Yet this is the reality for a majority of women in some rural areas in Kenya. While efforts are being made globally to reduce literacy rates, data from the United Nations Educational, Scientific and Cultural Organization (UNESCO) indicates that at least 750 million youth and adults still cannot read and write, the majority of these being women in sub Saharan Africa. The low socio-economic status of women in the Maasai community in Kenya puts them in the vulnerable group of the population that is likely to have low literacy skills. This excludes them from fully participating in their families and communities. By the age of 28, a majority of young people already have their professional goals well planned. Most have already completed their high school education. An even gradually growing number are way into their university education by the age of 28. This is how Nariku’s journey to economic empowerment began. 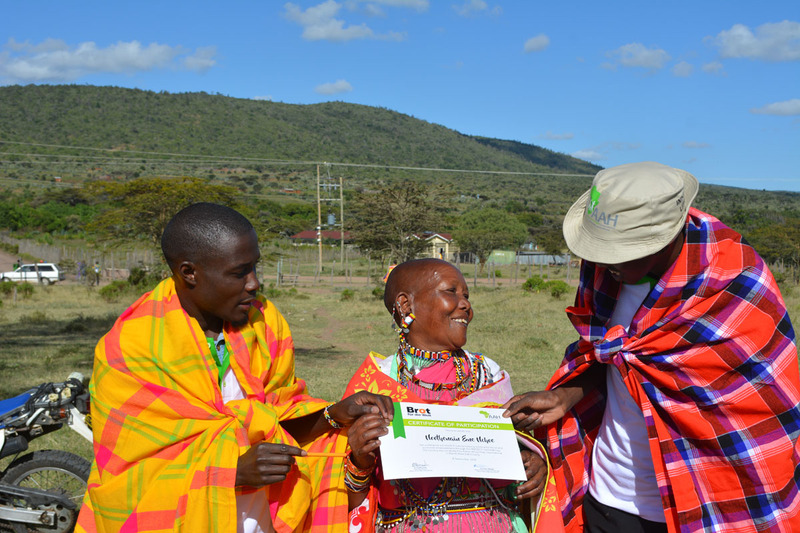 She and 337 other women in Narok West sub-County who graduated from an adult learners’ class run by Action Africa Help International (AAH-I) on 6 September 2018. These women embody this year’s theme ‘Literacy and Skills Development’ of the UN World Literacy Day marked globally every 8 September. These women successfully completed a 6-month training on numeracy and literacy skills for social and economic empowerment. All the 337 women aged between 15 and 69 years went into a classroom for the first time in their lives in 2017. “This was a dream I held dearly. I can now hold a pencil and write some letters of the alphabet and some numbers. I have waited all my life for this,” says 69-year-old Naatana Karbolo. The basic, adult and continuing education classes are facilitated by AAH-I using the REFLECT methodology. REFLECT is a training technique that provides a space for a group of people to meet and discuss issues relevant to them. Participants choose the topics themselves, according to their own priorities and are supported by a facilitator. The technique uses a range of participatory methods. There are 20 REFLECT Circles in Narok West sub County. The impact that literacy and numeracy skills is having on their lives and in the community is appreciated when you visit the Friday market day at Naikarra Centre. Most of the women from the REFLECT Circles have businesses at this market. Watching Nariku selling her cereal stock on market day it is heartwarming. “I tried to do small businesses but it was difficult as I could not tell what was coming in and what was going out. I would have goods sent to me from Narok town to Olderkesi, but I was unable to identify my merchandise because I could not read my name,” she says. Her classmate, 45-year-old Nolari Ng’otiek, says she has now learnt marketing skills, including how to display her stock at the market and how to negotiate for better prices from suppliers. For 26-year-old Noonkokwa Enole Karia, the classes have enabled her to better understand the grades and class positions that her four children have attained in school. “I am hoping that in future, I will be able to comfortably help my children do their homework,” says Noonkokwa. “AAH-I is one of the organizations supporting the Narok County Government in championing the actualization of the Incheon Declaration and Framework for Action for the implementation of Sustainable Development Goal 4”, says AAH-I’s Executive Director Dr Caroline Kisia. AAH-I supports a commitment to ensure that all youth and adults, especially girls and women, achieve relevant and recognized functional literacy and numeracy proficiency levels and acquire life skills, and that they are provided with adult learning, education and training opportunities. It is amazing just how the alphabet is changing the lives of these women.